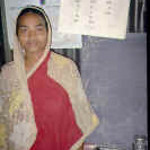 Monowora brought her son Abraham in to a medical clinic operated by Lutheran Health Care Bangladesh. 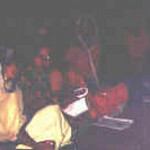 Women receive literacy lessons from a small group organizer. A group organizer teaches literacy classes. 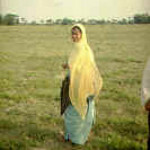 Mahamauda Begum is a group organizer, one of the "teal sari ladies." 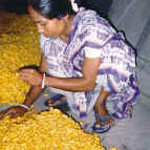 A woman sorts piles of naturally golden silk cocoons. A woman reels silk at a small RDRS factory.